The C1000 Touch thermal cycler offers superior performance and a large color touch screen for easy programming. This fully modular platform is able to accommodate different throughput needs with easily interchangeable reaction modules that swap in seconds without tools. 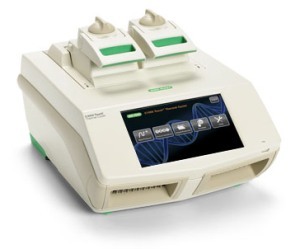 Each PCR module has a fully adjustable heated lid that supports a wide range of vessels and sealers, including low-profile and standard-height PCR plates.